Ethiopian prime minister Abiy Ahmed met with Chinese president Xi Jinping on the sidelines of China-Africa Cooperation Forum which is under way in Beijing. 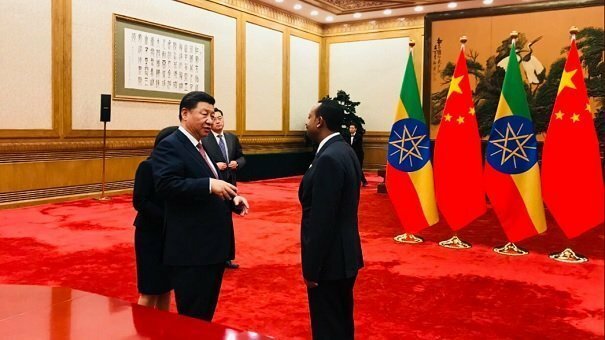 The Primer reportedly told Mr. Xi Jinping that China is the “leading development partner of Ethiopia” and that Ethiopia would like to share China’s experience of administrative practices. Abiy also expressed gratitude for what China has been doing to Ethiopia in recent years and that Ethiopia will be an active participant in China’s Belt and Road initiatives. Xi Jinping on his part said, “China is willing to continue support projects that ensure mutual benefit for both countries” He also pointed out the relation between the two countries is elevated to the level of strategic partnership. He also requested the Ethiopian Prime Minister to work in cooperation on regional and international matters. In addition, leaders of the two countries discussed topics ranging from Human Resource Development to Foreign Direct Investment to Agro-Business and natural gas. China is the leading FDI investor in Ethiopia which amounts to nearly 20 % of Foreign Direct Investment in the country. Prime Minister Abiy also met with the presidents of Rwanda, Sudan and Egypt and discussed bilateral issues, according to a report by Ethiopian Broadcasting Corporation.